Recently, I’ve been getting into the joys of using a new service (to me), Tumblr. Simply, they are a micro-update service be it text, video, pictures, etc. I’ve been using it frequently during my fit-blogging practice and it’s safe to say that I don’t understand everything about Tumblr. And as a user, I shouldn’t have to. This morning, I posted a status update. Not too long, approximately two paragraphs of text. 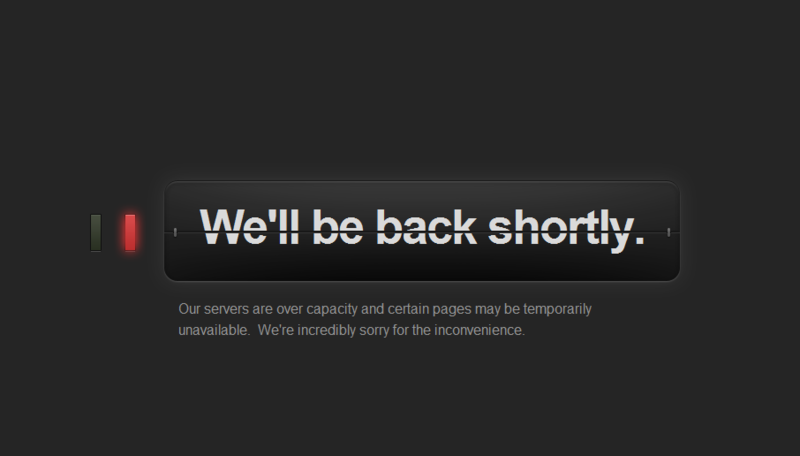 Afterward, I was met with an “overcapacity” message. Damnit. You have no idea what downtime means to an end user until it happens to you. I don’t care how often (or not) your service downtime is. I don’t care what apologies are on there. I don’t care. Just fix it. Let me love your service, not be disappointed. Sorry only goes so far to appease users. Along with this issue is the fact no notice or disclosure to live system issues was ever found in the application. That bugged me. Just tell me above the Create Post button that “we’re experiencing some database issues now. Save and hold tight.” This is proactive, not reactive. If you run a startup or a popular web service, please, please, advocate for your users and tell them something is wrong. Don’t wait until they find out. Likewise, I checked the Twitter account and I don’t see any recent updates, so that doesn’t help either.